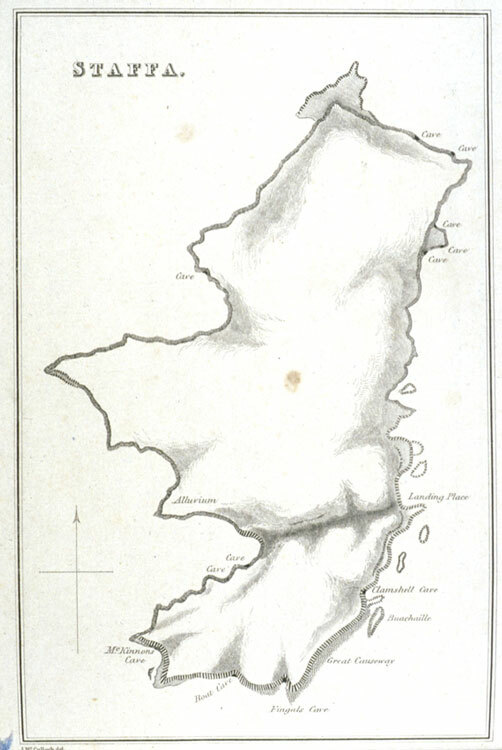 Although the inhabitants of the Hebrides islands had been aware for centuries that their local landscape contains spectacular formations of columnar basalt, the outside world did not learn of this until 1772, when Joseph Banks visited Fingals Cave on the tiny island of Staffa and had an artist make sketches of the island and its basalt caves. It is probably no coincidence that the "discovery" of Fingals Cave came just a year after Desmarest had found similar formations in the Auvergne and pointed out the resemblance to the Giants Causeway. Shortly, other basalt columns would be found on Mull, Skye, Eigg, and other islands of the Hebrides. But, as in northern Ireland, there were no volcanoes in evidence to account for the origin of the basalt. The map of Staffa is from exhibit item 50.